Blake NeeSmith didn’t think that he would have to wait so long. Looking back however, he wouldn’t have it any other way. The front man for Finding Favour expected the results to come much sooner than they have. To his credit, very few bands would expect to release a debut album four years after signing a record deal. 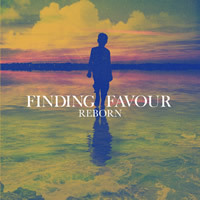 But Finding Favour had to also find their voice, and the experience of earning their right to record has been a journey worth taking, according to NeeSmith. On the verge of releasing their first ever full-length album, NeeSmith says the time behind the scenes has produced significant fruit for Finding Favour. You can hear the splendid results on Reborn, the band’s new album produced by Casey Brown (Love & The Outcome, All Things New). Now NeeSmith hopes that fans will enjoy it as well. Nearly ten years have passed since NeeSmith and company first decided to form a band. From the outset, they played anywhere and everywhere they could, mostly taking opportunities to lead worship — hoping that a big break would come their way. Then a few years ago, the long-awaited opportunity finally presented itself unexpectedly. After the deal was official, NeeSmith admits he thought they would jump right into the studio and hit the road. Unfortunately the industry has changed, which means that labels are treating new acts a bit differently than in year’s past. Talent is now developed, and artists have to wait. As a band, Finding Favour had to adjust their expectations. “[We signed] about four years ago,” says NeeSmith. “Right after, we said, ‘Alright, this is it!’ Come to find out, it doesn’t work that fast. They released the single and then they wanted to release a five-song EP. For a lot of these record labels, it’s not like it used to be, with new artists seemingly growing on trees or falling out of the sky like they used to. They just can’t afford for everyone to make a full record initially. Fortunately, good things were developing under the surface for both Finding Favour and their fans. The band’s first single, the aforementioned “Slip On By,” turned into a solid AC hit for them and additionally as a Top 40 country radio hit for Austin Webb. The band’s self-titled EP also earned them tour slots with Hawk Nelson and Building 429. And all the while, NeeSmith says, these opportunities were giving them the time to fully develop their craft. “There’s absolutely nothing that I would change,” NeeSmith reflects. “Going back to where we were and considering our development now, we are a totally different band. We realize that you have to earn it. Disappointments come and go along the way, but those should foster an attitude of hard work and transformation. Now that greater opportunities are presenting themselves, Finding Favour, also comprised of Allen Dukes (guitar), Dustin Daniels (bass guitar) and Josh Duckworth (drums), is taking full advantage. They recently completed a 42-city tour with Newsboys, and will soon join Crowder, Lauren Daigle, and rapper NF on an Air-1 tour. They’ll also hit the road with Sanctus Real later this year. A recent conversation with a fan after a show reminded NeeSmith of exactly why it’s been worth the wait. One of the band’s new songs, “Be Like You,” is a powerful single that’s already resonating with fans. NeeSmith says it’s those connections that confirm why they’re making music in the first place.